Derby has just officially been named as the second best place for an alternative night out. 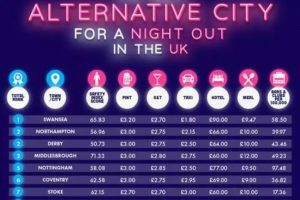 MyVoucherCodes has conducted research into 50 of the most popular towns and cities in the UK to reveal which is the best for a night out. The research looked at safety, the price of a pint/gin and tonic, cost of a taxi, the average cost for a one night stay in a hotel, the average price of a meal and the number of bars and clubs per 100,000 population. Derby was ranked highly for providing a great night out, that is not only cost-effective, but provides a safe environment. Derby narrowly missed out on the top spot to Swansea and came joint second with Northampton and Middlesborough.